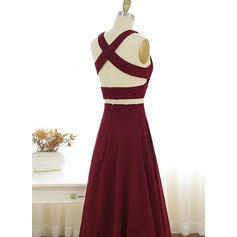 Ordered this for my senior prom and it is very beautiful. I got it a week earlier than expected. Which was a blessing considering the top had to be tailored. The bottoms fit perfectly but the top was too big. I did not buy mine custom made so it is understandable that it did not fit perfectly. The adjustments were easily fixed and cost very little. Fits her like a glove! Very Satisfied! !